Happy New Year and welcome to 2018! I am very honoured and proud to serve as the President of the CAGC and to be a part of this wonderful, ever-growing organization. We have seen a lot of growth in the past few years, both in our organization and in our profession. Genetic counsellors have become more prevalent than ever as our skills continue to be in high demand. As I write this letter, I reflect on what we have accomplished so far and am excited for what lies ahead. We are experts, educators, advocates, and leaders. It is important that we continue to highlight to those outside of our organization -- including other medical professionals and the public -- the value that genetic counsellors add. The CAGC Board of Directors is in the final stages of establishing a communication plan for the Association, including media training for our members, and we hope these initiatives will help our members take the lead in improving the visibility of our diverse and unique skills. 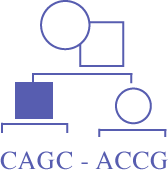 It is a very exciting time to be a Canadian genetic counsellor with the CAGC. Ideas conceived years ago have come to fruition and there has been growth in every facet of the organization: quality educational opportunities, national and provincial outreach programs, and most importantly improved benefits to members through unique opportunities and access to resources. We have grown large enough to host our own annual education conference. We can offer bursaries to our members to attend conferences and speak at other events. We are exploring innovative ways to work with other organizations and offer our expertise to impact legislation and professional regulation. We continue to release position statements that help shape the way we practise genetic counselling in Canada. However, with this growth comes growing pains. Our organization relies on volunteers and our needs can put a strain on those who dedicate their time to the Association. As we continue to grow, a number of different paths are open to us, including the possibility of working more closely with the NSGC to share resources and expertise. The CAGC will continue striving to be an organization that gives a national voice to your needs and concerns. I am proud to be a Canadian genetic counsellor who is engaged in this organization. I invite each of you to consider ways to be engaged, too. Together, we can continue to make our voices heard and our values understood. Please feel free to reach out to me with your thoughts, suggestions, and feedback. I can’t wait to see what we will achieve together.